A new rumor suggests Jason Momoa's Arthur Curry might be getting a more comic accurate costume in the upcoming Aquaman solo film. Quite a bit is riding on the success of James Wan's Aquaman as it's the only DC film slated to release in 2018. Momoa made his brief debut as Aquaman in 2016's Batman V Superman: Dawn of Justice, and he reprised his role for a proper introduction in 2017's Justice League. In the film, following a handful of scenes in civilian clothes, Aquaman borrowed an armored suit and a trident from Mera (Amber Heard) after thwarting an underwater attack by Steppenwolf. While Momoa resembled edgier iterations of the character from the '90s comics, it's widely believed that the suit wasn't Aquaman's final costume going forward in the DCEU. And now, it seems he may actually get a more comic accurate suit in his upcoming solo film. 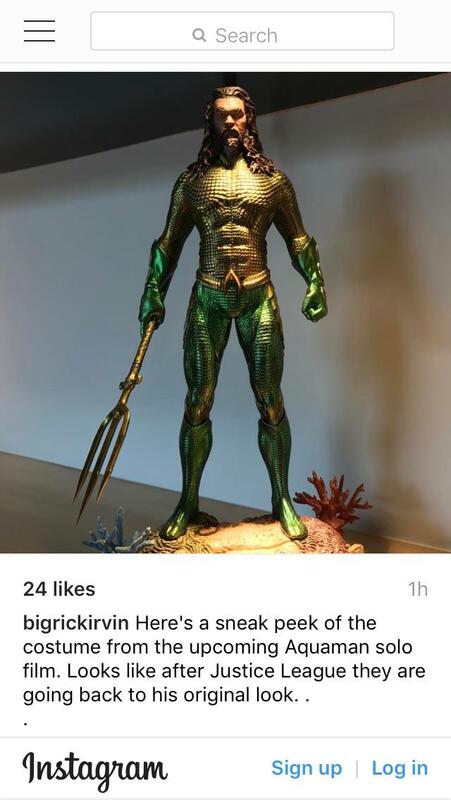 The Aquaman Shrine claims Warner Bros. showcased a comic accurate costume for Aquaman at a recent licensing event. This is actually not the first instance a report indicated Aquaman would be sporting the character's comic costume, as an image surfaced over the summer showcasing a yet-to-be-released action figure with Momoa in the gold and green, which you can check out by clicking the link below. This seems like a fairly reasonable development. The film's version of Mera is almost otherworldly comic book accurate, and it stands to reason Wan would want something of an aesthetic continuity. The DCEU has had something of a mixed track record as far as their onscreen characters resembling their comic book counterparts. Ben Affleck's Batman and Gal Gadot's Wonder Woman looked like they leaped off the page, but characters like the Joker and the Flash have undergone significant visual overhauls. Momoa's Aquaman fell somewhere in between in the costume department, though he's never going to be mistaken for the blond-haired, blue-eyed King of Atlantis from the comics. A tremendous amount of pressure lays on Aquaman's shoulders. Despite Wonder Woman becoming the DCEU's first undisputed success both critically and commercially, Justice League's failure may have thrown the future of DC's film slate into a state of peril, but that might not actually be the case either. After all, WB's DC slate was confirmed prior to Justice League's release. Still, the fact that DC is largely sitting out 2018 on the big screen means there will be tremendous scrutiny placed on Aquaman's late December reception. Encouragingly, there have been no rumors of production problems that plagued both Suicide Squad and Justice League, and Wan seems to have a strong handle on the character and his world. The notion of Aquaman sporting a classic costume is yet another sign that Wan is embracing the mythos and aesthetic of the source material, which will likely make fans of the character all the more excited for his first cinematic solo outing.